Earlier today, Telltale games (the studio behind The Walking Dead and The Wolf Among Us) and HBO Studios released the first trailer for their upcoming episodic game series Game of Thrones: A Telltale Game Series. The trailer, which I’ve embedded below, gives us a first glimpse of how the world will look, as well as introduce some of the locales we might see within the game. You might also recognize the voice doing the narration. Today Telltale has also revealed that some of the cast members from the HBO series will reprise their roles within the game, including: Lena Heady as Cersei Lannister, Peter Dinklage as Tyrion Lannister, Iwan Rheon as Ramsay Snow and Natalie Dormer as Margery Tyrell. Additional cast members will reprise their roles in later episodes. 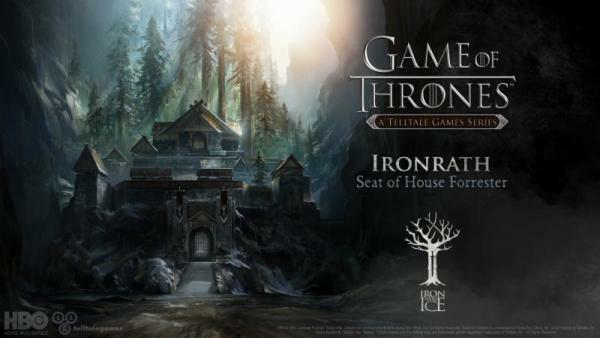 The game is based on the HBO series Game of Thrones, which is in turn based on the book series by George RR Martin known as the A Song of Ice and Fire. Telltale’s episodic game will span 6 episodes starting at the end of Season 3 and will end at the beginning of Season 5 of the television series. Players will be able to visit multiple locations within Westeros and Essos such as King’s Landing, The Wall and Ironrath in the North. You will play from the point of view of five different characters, either direct members of House Forrester, or in its service. House Forrester, though mentioned in passing within the books, is not featured within the television series. They are Bannermen to House Glover, which in turn owe their allegiance to House Stark in the North. While playing as the multiple characters, Telltale mentions that your actions with one character will affect your other characters within the story, something the player needs to be mindful of at every turn. The characters within the games have been revealed as exclusives on other sites, though Game Informer has done a great job of compiling a list of the characters for quick reference. The game is set to release later this year, though no official date has been announced. Game of Thrones: A Telltale Game Series will launch on PC, Xbox One, PS4, Xbox 360, PS3, iOS and Android, as well as other platforms still to be announced.